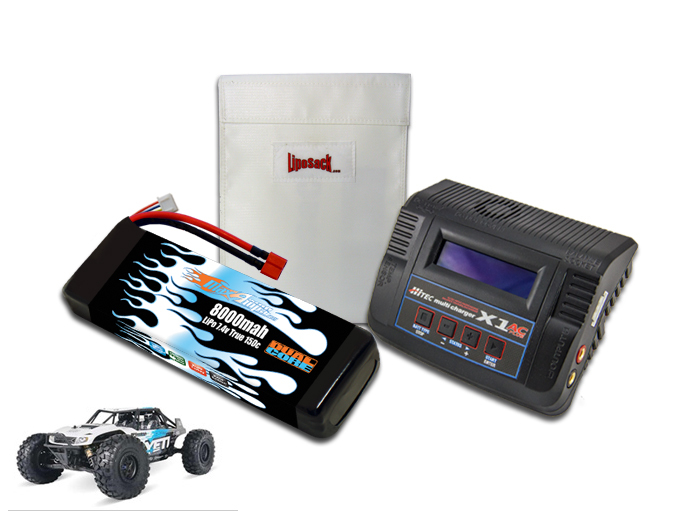 Kit includes everything you need to make your Axial Yeti Rock Racer scream! The new X1 AC Plus battery charger goes everywhere you go. Capable of charging all battery types, this charger is the affordable and portable answer to keeping your batteries charged and ready for action. The 50-watt X1 AC Plus will charge all your batteries at rates from 0.1 to 6 amps, using either 11-18V DC or 100-240V AC power sources. Designed to charge NiMH, NiCd, LiPo, LiFe, Li-Ion and Lead-based batteries, the X1 AC Plus is the perfect charging solution for your RC hobby. Drivers and piolts alike will appreciate its price and relish in its dependability. Charge your batteries safely and efficiently with this simple to use system. You can charge in AC mode by plugging into a wall outlet or you can charge in DC mode by attaching it to a 12-volt car battery or a 11-18 volt (20A minimum) DC power supply.